In Thailand, the dense, evergreen forest and the open deciduous forest. Furthermore, there is still untouched rainforest left. Below some of the most important trees and flowers is described that are available in the country, both economically important and for their own food in many cases. The palm can grow up to 30 meters high and is extremely useful because everything on it is to use. Nectar of blossoms is drunken as they are or distilled into liquor. Coconut milk can be drunk, the flesh eaten or pressed into oil, the shells of the nuts are used for jewelry and fibres used to twine and become both rope and brooms and the strain becomes a building material. Naturally grows singly or in small groups in northern Thailand. They may under favorable conditions be approximately 30 meters high. The wood is hard, strong and very durable. It contains resinous oils that make nails and screws do not rust. Teak can even resist termite and fungus. The timber is mainly used for making furniture, flooring and for boats and ships. However, illegal logging have reduced the teak stock near to catastrophic levels and authorities are reviewing the logging of the teak forest. The rubber tree comes from Brazil and do well in Thailand's hot climate as it requires a lot of water and not too low temperature. Tree reaches a height of 15-20 meters. The rubber is extracted by adding a cut all the way around the tree, then the milky latex flows down into a bowl. From each tree you can get seven grams of latex a day (100 grams latex contains 30-35 grams of rubber) Tapping is done every third day early morning before the sun comes up and gets the latex to solidify. One worker taps 250-300 trees every morning. The plant is not a palm, but a tropical perennial (many years plant) stalk is false. Leaves coming out of a sheet stock and can be 5 meters high and 1 meter wide. They are very useful and are used for covering the roof and packing but also for cooking that uses banana leaves to roast things in the blade. Bamboo includes several tropical grasses families containing a total of approximately 50 species. The straw is hollow and woody and can grow up to 40 meters high. Bamboo grows very quickly at the beginning up to 3 cm per hour. New plants protruding from the roots as the old pipes die. Bamboo is used for much, just to name a few you manufacture musical instruments, build bridges, aqueducts, houses and furniture. The young sprouts is preserved or eaten as vegetables. The flower belongs to the earth's most species-rich plant family. There are nearly 25,000 species of this flower and represents one-seventh of all flowering plants. The orchids are woven into beautiful decorations. The only real beneficial kind among the orchids is the Vanilla Planifolia whose fruits are known as vanilla. 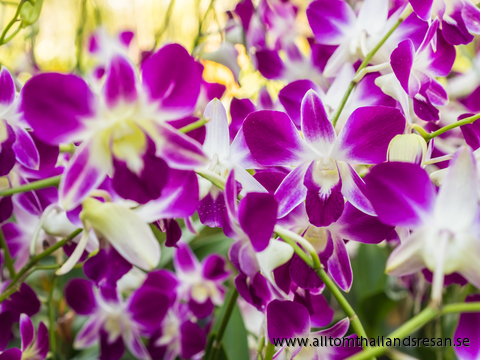 Take the opportunity to buy an orchid home, at the airport, you can buy prepackaged flowers and well at home, the durability is up to 1 month. The lotus belongs to the family of water lily and is a religious symbol in Thailand. All along the canals, the lakes, ditches and ponds you can see the beautiful plant. The plant's fruit is located at the seed bracket and can be eaten raw or roasted. Moreover, the plant is used as a vegetable. Is an annual grass, and perhaps the world's oldest cultivated plant. Rice is the main industry for millions of people worldwide, and in Thailand the food consist rice with a variety of dishes and accessories.